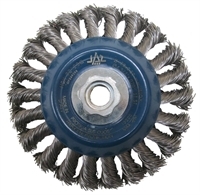 We stock a great selection of stainless steel wire brush wheels for use on angle grinders, die-grinders, drills and fixed spindle machines. These are popular with manufacturers of food, drink and pharmaceutical equipment, marine components and architectural equipment. 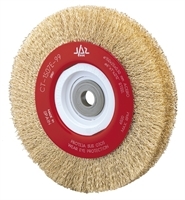 Our wire brush wheels are industrial grade. Crimped steel wire is brass coated for increased flexibility and longer life. A full range of profiles and mountings is stocked.